only £3, which is mental if you ask me!! Once again its a fairly generic wagon, which can be used for loads of periods. Riding the wagon is a Foundry wagoneer, wish they sold this chap separately?? Come on Martin, lets have some civvy drivers for your wagons!! This ticks all the right boxes. 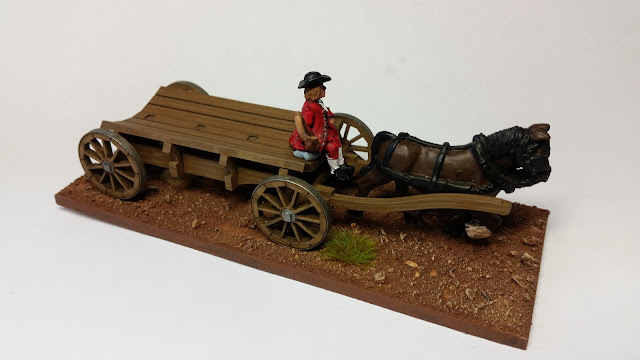 Nice cart, nice base, nice figure all look well painted and would improve most games of this period. Nope, you can never have enough bumph! Brilliant! Just what I need too. Those clever Warbases people. Nicely presented here. They are clever chaps aren't they? Does the horse come with it as well? Three pounds is cheap. Afraid not Alex, you have to buy them separately. Looks nice, very very nice! Do I hear that wallet opening Phil? Lovely job - looks great! Great job on a lovely piece...and a bargain to boot! Indeed!! On the bargain thingy anyway!! This mini has a cartload of character Ray, well executed as always! Splendid work my good man. Nice job with it and your right, 3 pounds is mental! Very tasty Ray. 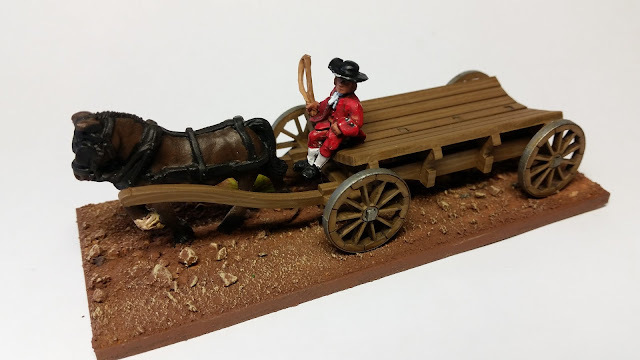 Check out Irregular, they do all sorts of drivers in various scales with their own wagons and will in all probability sell you a pack if you ask nicely. Hmm? Didn't think about Irregular, nice one George! Looking good and it is about time manufacturers mad seperate paccks of 'specialist' figures. Will you have any cargo for them, like hay, wounded soldiers, the farmers family and furniture ? Yep I will, just gotta get some stuff painted up.